Semi Cure the printed transfer paper through a Tunnel Dryer until touch dry but take care no to fully cure. Typical heat requirements are 110-120ºC for 30-60 seconds. Place the garment on the Heat Press platen and position the transfer on top, print side down. Close the heat press at the high pressure setting and leave for 10-15 seconds at a temperature of 185-190ºC . Open the press, carefully remove the garment with the Transfer still in place and allow cooling. When cold, carefully peel the paper from the garment, to leave the print attached. Cold Peel Transfers produce prints that are usually flexible and wash-resistant but, as with all plastisol prints, they are not resistant to ironing. These properties will vary depending on the ink and printing conditions used. 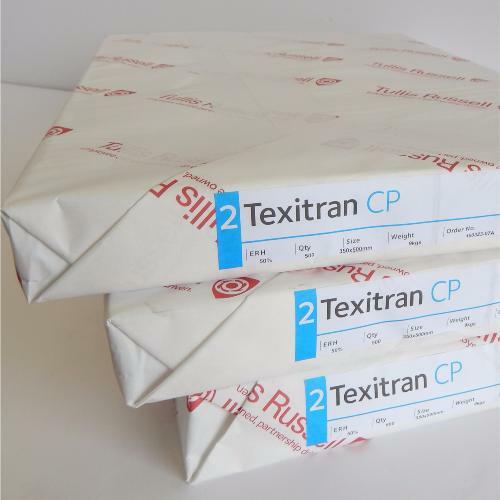 Use Plastisol Inks Rutland M3 or Pyramid ink range un-thinned to gain maximum opacity and adhesion. At £65.00 per pack of 500, this works out at only 13p per sheet.